New Delhi: MapmyIndia has announced that the new Tata Vista D90 now offers in-dash GPS navigation system powered by MapmyIndia. 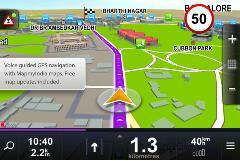 The integrated GPS navigation system will be available as a standard feature in the Tata Vista D90 ZX+ model. The Vista D90 car owners will now be able to access detailed and updated map coverage of India – covering 10.33 million places; 1.9 million road kilometers; 600,000 villages; 4,787 cities at street-level; 50 cities at house-level; 46 cities in full 3D driving directions to 30,000 tourist locations , including advanced and localized navigation and driver assistance features such as extended lane guidance, sign-posts, rich points of interest, regional voice guidance and regional maps. MapmyIndia’s GPS navigation system offers turn-by-turn, voice-guided navigation to doorsteps. The maps provide, full 3D coverage of India, with thousands of full?scale 3D landmarks across India, and full 3D city models containing 3D buildings in residential and commercial areas for 36 major cities across India, including all the major metropolitan areas. Major car models have already integrated MapmyIndia navigation as part of their offering, – such as the new Honda City sedan, the new Tata Manza entry-level sedan, the top-selling Mahindra XUV 500 SUV and the premium Mahindra Ssangyong Rexton SUV, the Ford Endeavour SUV, the BMW 7, 5 and 3 series luxury sedans, the Jaguar-Land Rover Freelander 2 Luxury SUV, the Fiat Linea sedan, the Renault Scala sedan, among others.